Spring is the high season for moving to a new location offers many benefits, but challenges too. The big housing question is where is a suitable relocation site which will offer all the amenities needed with the prospects of improving one’s situation? Efficient shelter from the elements is always on the top of the list. While it may be sunny and pleasant today, there will be rainy and cold days to come. Access to groceries and something to drink is another important issue. A safe and consistent supply of food and water is part of the decision process. Selecting neighbors is important, too. It is essential to fit in to the new area and have no worries about what the neighbors will think or do. This is what successful honeybee colonies, both domestic and wild, will do every spring. They have the instinct to know when their current housing space has reached its maximum capacity and it is time for a newly hatched queen to lead a swarm of worker bees, all female, to a new location. When the honeybees decide their home is too small, a group will be led away by a new queen to find better quarters. 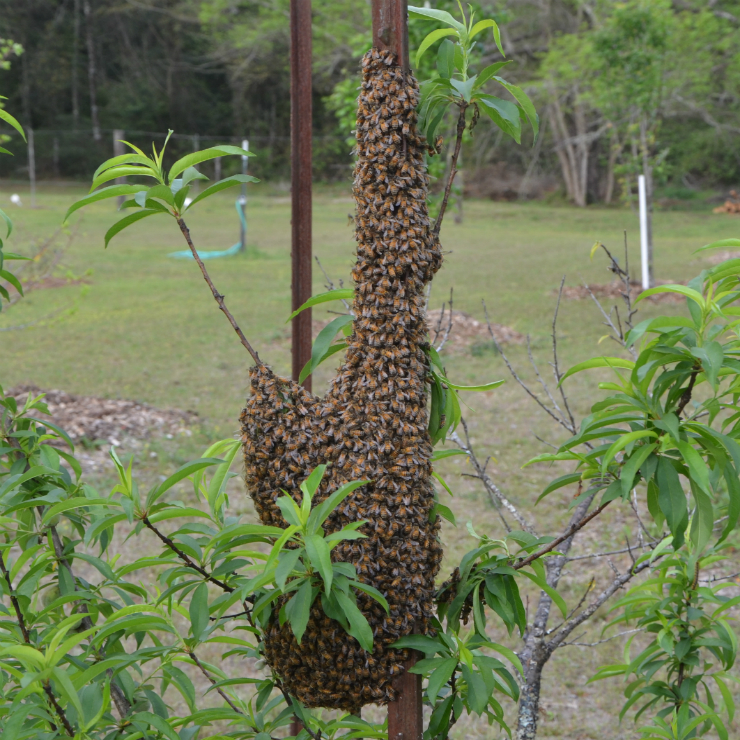 This swarm appeared in one of the peach trees in the UF/IFAS Extension Wakulla County Master Gardener Demonstration Orchard. The initial foray to a new home begins with the departing honeybees collecting near the hive. Conveniently located tree branches are a common collection site, but these social insects may assemble their colonizing swarm on structures such as roof peaks. The sight of a buzzing bundle of insects frequently causes concern from the property owner who is inexperience with the honeybee’s intent and objectives. Contrary to Hollywood’s portrayal of these pollinators, honeybees have no plan to malevolently evict people from their homes or attack domestic animals. Once all the relocating honeybees have emerged from the hive, they cluster around the new queen at their temporary site. Soon scout worker honeybees begin exploring for a new nesting location. As the scouts return to the temporary swarm location they report on their exploratory efforts by doing what has been described as a dance. It is thought the dance signals the direction and distance to the proposed location for the new nest. The more animated and excited the worker’s dance, the more likely she will convince other scouting workers to follow her back to the possible new home site for further assessment. Depending on the number of favorable reports back to the swarm, the process of elimination for a new home may take up to several days to complete. If the swarm is attacked at the temporary site, they will move to a new and safer site while their exploration continues. Once the new hive site has been selected, all the honeybees will vacate the temporary site. 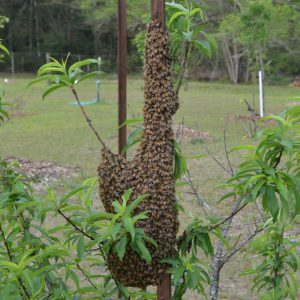 Wakulla County’s beekeepers do their best keep to their hives from swarming to new locations. They do this by moving some of the worker honeybees to empty hive boxes and install a new queen. The labor intensive process takes several days to be assured the workers accept the new queen, and their new home. Still in most cases, it is less of a hassle for the honeybees to accept a new hive box and stay in the old neighborhood. Demonstration hives can be seen at the UF/IFAS Extension Wakulla County Master Gardener Plant Sale on April 6, 2019. The location is 84 Cedar Avenue in Crawfordville and the sale begins at 9:00 a.m.
To learn more about honeybees in Wakulla County contact the UF/IFAS Wakulla County Extension Office at 850-926-3931 or http://wakulla.ifas.ufl.edu/.